Considering the PDP-8, PDP-7, PDP-9, PDP-1, even though they are completely different architectures (from a programmer's or compiler's point of view at least), they have some remarkable similarities in some details. For example, the microcoded instructions on both the PDP-8 and PDP-7 have cla, cll, cma, cml, and single or double rotations, which conveniently build up small constants in the accumulator. The same two computers also have exactly the same skip instructions, and a bit in the instruction to indicate an indirect memory access. The same operations are also available in the PDP-1 instruction set, as are, obviously, things like add, and load. The same two computers also have an optional EAE, which provides another register MQ and some mathematical operations, though the size of MQ obviously varies between 12 and 18 bits. So straight away, my mind is supposing that there's some kind of commonality in the implementation as well. Maybe there's even a single part, which implements all these operations on a bit or group of bits, and which is installed in all these computers to implement a register and ALU. Maybe there's some part which takes a bitfield from an instruction, and determines which of these operations need to take place (and is thus part of the instruction decoder) and is installed in at least some of these computers. Are there large subsystems in common between the implementations of both 12-bit and 18-bit PDPs, which are responsible for the patterns and similarities between these two groups of computers? Yes, at a physical level there was some commonality, but not at as high a level the question references. These modules preformed fairly simple logic function that were highly reusable, for example a R107 module implemented seven inverters (NOT gates) using discrete transistors. You can find the datasheets and documentation for the flip-chip modules in the Digital Logic Handbook. Later versions of DEC processors were more integrated, with more functionality on one custom board, and as integrated circuit technology developed, a SSI digital logic chips could do everything a flip-chip could, in much less space. For comparison, a SN7404 IC implemented a six bit inverter function similar to the R107 flip-chip. By 1969, new DEC designs began using integrated circuits rather than the discrete transistors of the older flip chip modules. The modules however remained in use for some time after this. 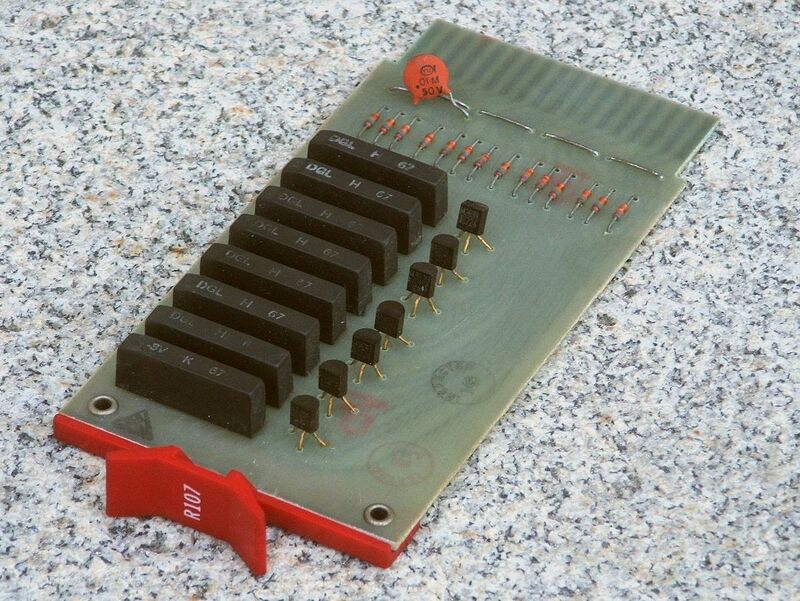 If memory serves, the early PDP-10 and PDP-11 models also used the red-handled R-series modules as well. Those machines were in use well into the 1970s and early 1980s, so spare modules for repair were common. It may also be of interest to note that in the 1970s, Texas Instruments ICs such as the 74181 ALU bit-slice were used in processors produced by several different vendors, including DEC. But these did not influence the instruction sets much either. There were obviously no same parts that were doing any of those operations. The DEC hardware evolved from transistor technology (PDP-1, PDP-8, etc.) to medium-scale IC logic like standard TTL (PDP-8/E, early PDP-11) and eventually to large-scale ASIC CPUs like LSI-11 or 6100 PDP-8 clone. The similarity of instruction sets has nothing to do with the actual implementation of the CPUs. Thus, even on discrete transistors, you can have just different implementations of flip-flops or latches, different implementations of the same logic gate like NAND or NOR (for example, DTL-like logic vs ECL-like logic), etc. Level up, you can have different logic implementations of the CPU, for example, PDP-8/S is a bit-serial CPU while all other PDP-8 machines are bit-parallel. On latter bit-parallel CPUs, the execution of the command might be microcoded or hard-wired which again results in completely different logic structures of the corresponding CPUs. The ISA (instruction set architecture) is the very top level of the CPU, and you can have two completely different CPUs executing just the same instructions. Therefore, similar or even coinciding instruction sets of two different CPUs yield exactly no information of their internal structure and how they execute some specific instruction. As I recall, the PDP 1 through 6 were built from system modules, and these came out before flip-chips. The 7 was like the 4, only the 7 had flip chips. The 8 was like the 5, only the 8 had flip chips. The 10 was like the 6 only the 10 had filp chips. The 11 was a departure in architecture in several ways. Word size, instruction set, memory addressing, and so on. Not the answer you're looking for? Browse other questions tagged hardware dec or ask your own question. What register size did early computers use? Origin of the NZVC condition codes scheme?